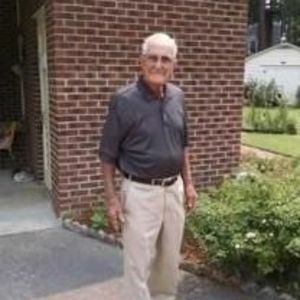 William J. Windham, Sr., 92, of Wilson, passed away Sunday. Funeral services will be conducted 2:00 p.m., Thursday, July 20, 2017, at Thomas-Yelverton Funeral Home, 2704 Nash St. N, Wilson, NC. Interment will follow in Evergreen Memorial Park. The family will receive friends from 1:00 – 1:45 p.m. Thursday, prior to the funeral service, at Thomas-Yelverton Funeral Home. Surviving are his wife, Vurgia Strickland Windham; three daughters, Peggy W. Warren of Autryville, Rachel Windham of Chapel Hill, and Joanie W. Moore and husband, David, of Wilson; a step-daughter, Brenda Watkins of Jacksonville, FL; a step-son, Reggie Peacock of Wilson; eight grandchildren; fifteen great-grandchildren; and one sister, Barbara Turnage of Wilson. He was preceded in death by his first wife, Adell Walston Windham; his son, William J. “Billy” Windham, Jr.; two sisters; and three brothers. Flowers are welcome and memorials may be directed to Home Delivered Meals (Meals on Wheels), c/o First Presbyterian Church, P.O. Box 3184, Wilson, NC 27895.